Elizabeth Conner, executive director, Humboldt Bay Housing Development Corp. The night of Thursday, Sept. 27, a fire caused $20,000 damage to a house just outside Arcata city limits. The home had recently been renovated at a cost of $30,000, with new floors, paint, roof and more. “It was spotless,” said owner LaVina Collenberg (mother of the late Randy Collenberg of “Cab 10” fame). It’s not spotless now. 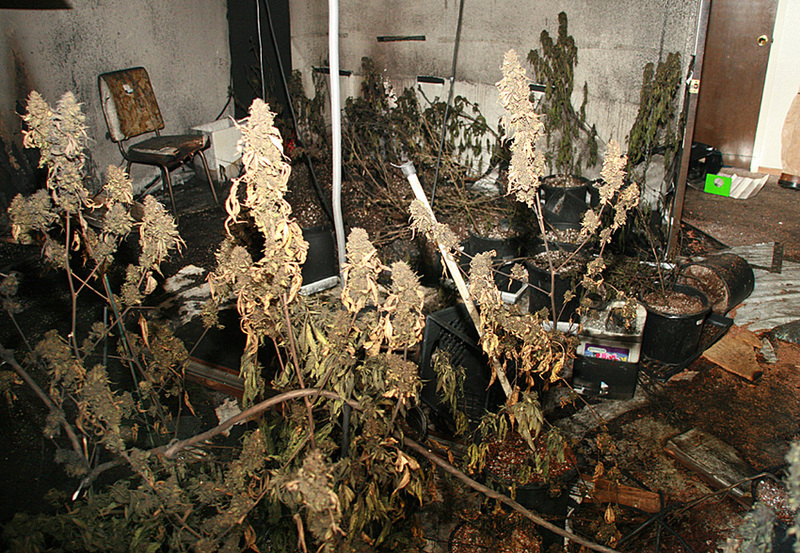 A back room in the house caught fire when a fan fell over, burning up and scorching many marijuana plants. But plants growing in several other rooms which had been converted to gardens were unscathed, and according to neighbors, two U-Haul trucks have been to the house since last night, removing the rest of the plants. Beyond the fire damage, the house had been heavily modified to enable large-scale cultivation, with holes cut in the ceiling to allow ventilation ducts, a huge hole cut in a floor, irrigation systems, even a wall added in one area. Ventilation ducting and chains for hanging the now-dismantled lighting systems dangle from ceilings. The tenant, Cody Nehring, said that the grow was a “cooperative” for five medical marijuana patients. Indeed, five Prop 215 certifications were posted on the living room wall, one with Nehring’s name on it. The Humboldt County Sheriff’s Office reportedly will not charge the occupants with anything, as they were duly covered by Prop 215. Nehring insists that the marijuana was for medical use. He said no one had lived at the house in months, and had no explanation for the cases of butane in the corner of the dining room. Butane is commonly used to extract THC-laden resin from marijuana, creating hash oil. “I don’t know about that,” Nehring said. Arcata Fire Chief John McFarland said the cases of butane could have easily killed firefighters, tenants and even neighbors, had the fire reached it. 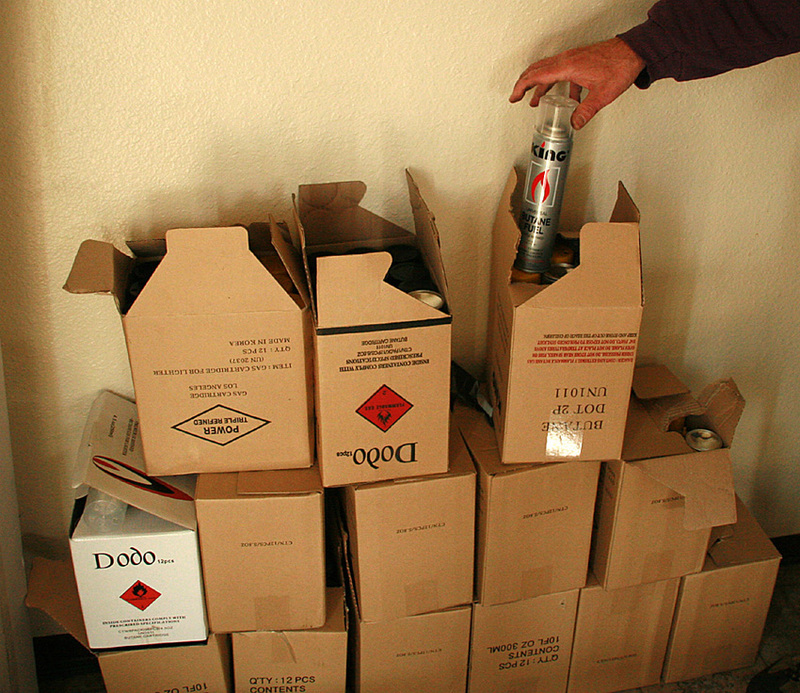 Nearby was another box containing hundreds of of spent nitrous oxide cylinders. Though one room contained children’s toys along with grow equipment, Nehring said the house was not occupied – that it was entirely dedicated to growing. Dr. Ken Miller, who issued Nehring’s 215 Certification, said he regretted the fire. He wants grows to be inspected and approved by private electricians. He wouldn’t say what fee he charges for the medical marijuana certifications, only that it was under $150. But an entirely new and unanticipated phenomenon has cropped up, so to speak: neighborhoods going silent. In some areas of town, homes which used to house students have now been converted to indoor gardens. Humboldt State University has become concerned about already-limited student housing drying up. Further, controversial new subdivisions have been proposed, some on agricultural land, and an unresolved question is how many of the new houses would wind up as grows. The challenge is to uphold state law, protect the rights of medical marijuana patients and their access to medicine while respecting property rights, but at the same time doing what’s legally possible to preserve housing for human beings. 1. Determine any need to regulate clinics and grow houses. 2. Provide direction to staff regarding residential grows being allowed only as “accessory use” and subject to “specified standards”; establishing those standards; designating Commercial and Central Business Zones as the only locations where medical marijuana clinics are allowed; capping the number of clinics at four; and providing siting criteria for “replacement” clinics. 3. Staff also asks the council to develop standards for the draft Land Use Code which is now being written. Even some who support the 1996 Compassionate Use Act allowing medical cannabis acknowledge that there are instances in which the 215 certifications are a cover for industrial marijuana cultivation for profit. But how to weed out the exploiters and abusers from the legitimate medical patients for whom marijuana provides the only relief? These include cancer patients, those undergoing chemotherapy and many, many other maladies. We’re looking for guests for the Thursday, October 4 Humboldt review. They might include political decisionmakers, physicians who prescribe marijuana under Prop 215, patients, landlords who’ve suffered property damage, police, firefighters, attorneys… and you, with questions. Details are still emerging; stand by for updates. A 215 permitted grower can actually have a fire inspection done,is that correct?I’ve always thought that was the case.And if so,why would one opt not to do that? My guess would be that they don’t trust the Fire Dept. not to narc them out to the police. Especially with thousands of dollars and asset forfeiture staring them in the face. And especially if, on top of those not entirely preposterous concerns, one is smoking and maybe a wee bit paranoid. But if they were 215 permitted,it shouldn’t matter if they were “narced” out,they’re permitted to do so.But I guess some would be worried about the police stealing their stuff. Point taken. Legal 215ers ought not, in theory, have anything to fear. And I know the Fire Department is perfectly willing to do the work, rather than have to put out a fire later. However, some grows aren’t 215-friendly, and there are those more, let’s say aggressive implementations of 215 that one might not want to invite anyone at all with a badge in to look at. Karma that is all I got to say. Interesting discussion on the show, Kevin. I missed the first part, hope I can get the podcast. I wish we had had more time for the last three guests, Elizabeth, Ed and Mariellen. We were getting some good points made 55 minutes into the show. I think we would have gotten more phone calls, too. How about those numbers? Two estimates of the number of homes used whole or in part for grows in Arcata: 750 and 1,000. That was nice of the caller, Jay, to call me “Hank.” But I’m just his scheming soundalike. And there will be a podcast, as usual. You could’ve filled at least two hours. Elizabeth had some fascinating points, and alot of people would like to hear what she has to say – and teach – about how to deal with this in crafting their leases. 2. No exotic fire alarms – I think this is a mistake that should be pointed out to people setting up indoors. They need alarms. 3. Butane – Explosive danger should be pointed out to growers as well. Perhaps at point of purchase? 4 People abandoning others in medical emergencies. Like? I thought this was a red herring. Then I heard that someone was found dead at the Best Western in Garberville & wondered if he was thinking of this. It sounds like something from the hard drug world, that, like an urban legend got attached to marijuana in the Chief’s mind. 1. Does she ask renters about all their prescriptions for all substances? If not, she is probably in violation of the law however vehemently she denies it. If so, same result I’m afraid. Medical privacy is a big deal. I don’t think you can ask if prescribed before you know they are using. Does she check on other tenants handing around seditives etc? 2. Has she ever read the Fed drug-free rules? I went over the drug free workplace act pretty throughly and it has no teeth, and makes few requirements on people getting funds. I find most people who explain they get federal funds are hiding anti-marijuana sentiments behind federal alibies. HSU is doing this and may be facing a law suit. She could be too (I have no idea if she is facing a suit, & I don’t know any of her renters). 3. Inspection is probably ok, if she’s inspecting everyone. Looking at the electric bill, as she suggests, seems difficult to do without reading someone else’s mail – a definite violation of law. a. No agricultural operations is probably bad language. It does have a no grows for money sound about it, but it is not very well stated. How about no growing for people who are not residents? And of course no alterations. 4. 215 patients are covered by the disabilities laws. She should ask her attorney about that. 5. Housing units. I was really interested in the 7500 unit fact, and the breakdown. I though her 750 grow house estimate was a wild guess. c. How many units devoted entirely to growing and thus unavailable for students. d. If 1000 or 750 units have come off the housing market why can’t I raise the rent on the units I own in Eureka? Why should I ever have a vacancy. e. Is the university adding students to the area over the usual enrollment? 1. 99 plants hasn’t been the law for years. Cops need a current education about medical mj law. 3	How many fake 215s has he found. Do they routinely verify 215s? Keep their own database of which ones they’ve seen? 4. Organized business using multiple houses? Like? It seemed to me he mixed this up with “Larger structures with diesel generators” so it was difficul tto tell exactly what he was discussing. 5	Is Arcata typical of urban Humboldt in its growing indoors? 6	They got 300,000 plants and didn’t get it all. How much (ballpark) didn’t they get. What happens to it? On the other hand Jack got tossed in at the last minute and probably wasn’t really able to prepare as he would have liked to. 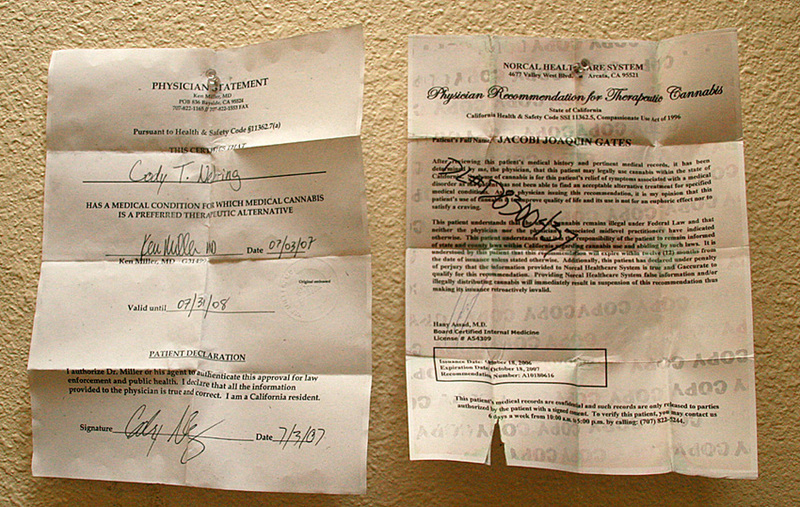 as of january 2010 the california supreme court ruled that there are NO LIMITS on medical marijuana growth and possession .